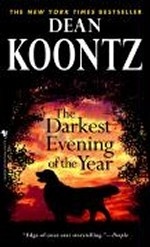 Аннотация к книге "The Darkest Evening of the Year"
Amy Redwing has devoted her life to rescuing dogs. But the unique bond she shares with Nickie, a golden retriever she saves in the most dangerous encounter of her life, is deeper than any she has ever known. In one night, their loyalty will be put to the test, and each will prove to the other how far they will go-when the stakes turn deadly serious. Формат: 10,5 см x 17,5 см.